If you are a tea connoisseur and drink it many times a day, you probably know that quality teas, such as the Pu-erh tea, can't be left in water for long and has to be steeped freshly each serving to prevent it from becoming bitter. In order to avoid boiling water half a zillion times a day, it makes sense to use a water boiler & warmer (also known as an electric thermal pot) which is an appliance that would not only boil the water, but also keep it warm at constant temperature all day long. These units are usually reasonably priced, very easy to use, and don't take up too much space horizontally or vertically. You simply fill the boiler with water and plug it in. It boils the water and then keeps it at a set temperature of your choice all day long. 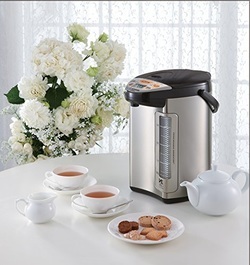 Water is dispensed at the touch of a button anytime you need it for hot tea, instant coffee, instant soups, etc. While certain teas need to be steeped in cooler water, other types and certain drinks (such as soups, coffee, etc.) may require the water to be warmer or hotter. Therefore, the best thermal pots available today provide you with a choice of temperatures at which the water can be maintained once it has boiled. Electric thermal pots are also very useful when you have a party, birthday celebration or any other sort of gathering during which you need to serve tea or coffee to a large number of people. This article will compare the three most popular water boilers & warmers bought by Amazon customers at the time this article was written. They are Zojirushi CV-DCC40 VE, Panasonic NC-EH40PC and Rosewill R-HAP-15002. These three water boilers & warmers were the top sellers in their category and had received excellent reviews from Amazon customers (an average rating of 4 stars and more out of 5 stars for each of them!). Selected Water Boilers & Warmers on Amazon. Zojirushi CV-DCC40: It has 4 temperature settings: 160°F, 175°F, 195°F and 208°F. Quick Temp mode allows reaching 160°F, 175°F, or 195°F keep warm temperatures directly without having to reach first the boiling temperature of 208°F. Panasonic NC-EH40PC: Boils the water to 212 then drops back to the selected holding temperature. Holding temperature settings include 208, 190, 180, or 140 degrees F.
Rosewill R-HAP-15002: Boils the water, then drops back to the selected holding temperature. Holding temperature settings are 208, 185, and 149 degrees F.
Most water boilers first bring the water to the boiling temperature and keep it there for a number of minutes so that most of the chlorine is removed before they lower the temperature to the selected keep-warm level. The Quick Temp feature of the Zojirushi significantly reduces heating time by allowing to reach the 160°F, 175°F, or 195°F keep-warm temperatures directly without having to reach first the boiling temperature of 208°F. Other benefits include reduced steam and reduced energy use. Note that this mode should be used when dechlorination is not necessary, such as when using bottled or chlorine free filtered/purified water. This mode saves electricity by shutting off the power to the heater after the boiling process completes, and keeps water warm by vacuum insulation only. All three water boilers indicate the selected temperature on the control panel, but only Zojirushi CV-DCC40 uses an LED screen for the display. Panasonic NC-EH40PC and Rosewill R-HAP-15002 use special lights to indicate the selected temperatures. By setting the timer, you can have hot water ready within a specified time. If you set it before you go to bed, hot water will be ready for tea, instant coffee or your cereals the next morning. When the timer is set, the electricity is automatically cut off until needed to heat the water. Therefore, it also saves energy by not having the boiler on all night long. Zojirushi CV-DCC40 timer function can be set from 6 to 10 hours. Panasonic NC-EH40PC delay timer can be set for up to 6 hours. Rosewill R-HAP-15002 does not have this feature. Zojirushi CV-DCC40 will automatically shut off to avoid overheating when there is no water left in the boiler or when the lid is left open. Panasonic NC-EH40PC will automatically shut off if water level gets too low. 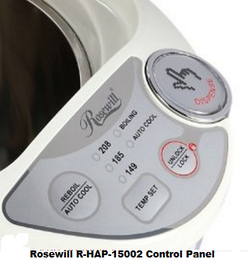 The dry-boiled feature on Rosewill R-HAP-15002 will protect against no water situations in the pot. All three units have a water dispenser unlock button for safety. You have to hit first the unlock button, then the dispense button in order to get hot water. Zojirushi CV-DCC40 has audible indicators to alert the completion of the boiling process or a low water level. There are 2 sound choices: "melody" and "beeps", and they can be turned off. Panasonic NC-EH40PC and Rosewill R-HAP-15002 do not have audible indicators. Zojirushi CV-DCC40 has a clear coated stainless-steel body with a non-stick coated interior. Panasonic NC-EH40PC also has a non-stick coated interior. Rosehill R-HAP-15002 has a stainless steel outer shell with a stainless steel inner pot. Zojirushi CV-DCC40 is equipped with a descaling mode which cleans the inner container when water is boiled with Zojirushi's Citric Acid Inner Container Cleaner (CD-K03E) or any citric acid. The cleaning mode is initiated by pressing the REBOIL button for more than 3 secs. To obtain Zojirushi's Citric Acid Inner Container Cleaner (CD-K03E), please see below the Amazon products section. Panasonic NC-EH40PC is equipped with a cleaning mode. To descale the boiler, you can either buy a special cleaning solution (like the Zojirushi's Inner Container Cleaner), or use any citric acid. Rosewill R-HAP-15002 has no cleaning mode. Here again you can use citric acid or buy a special cleaning solution to clean the boiler. Note that you can make your own citric acid by mixing half a cup of lemon juice concentrate with water in the pot. You can then then run it through the cleaning cycle of the machine, if there is a cleaning cycle. Otherwise you can clean by hand using the solution. So which of the three warmers & boilers should you buy? It uses super vacuum-electric (VE) hybrid insulation technology to keep the water at the desired temperature thanks to which it does not have to reheat the water as often as other brands may need to. As a result it uses little electricity, and though the machine costs more when you buy it, you would save money in the long term on energy bills. ​It is the only one of the three water boilers with the energy and time saving QUICK TEMP feature, explained in Note 2 above. Its delay timer function is more flexible than than the one on the Panasonic NC-EH40PC (6 to 10 hours for Zojirushi instead of 6 hours for Panasonic). It has audible indicators/warnings that can be silenced. Panasonic NC-EH40PC and Rosewill R-HAP-15002 do not have audible indicators. If any of the above listed points is a requirement for you, you may want to consider the Zojirushi CV-DCC40. Otherwise you will be quite happy with the Panasonic NC-EH40PC or Rosewill R-HAP-15002 as well. But when you choose between the Panasonic and the Rosewell, though most of their features are similar, keep in mind that the Rosewill does not have a delay timer feature. 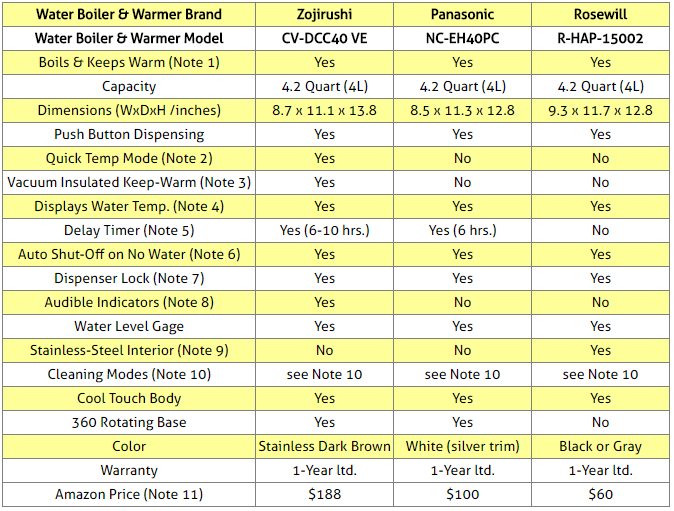 As a final note it's worth reminding that, at the time this article was written, all three boilers had received excellent reviews from Amazon customers with an average rating of 4 stars or more (out of 5 stars) for each: 5 stars for the Zojirushi, 4.5 stars for the Panasonic and 4 stars for the Rosewill. You will find below, all three water boilers & warmers compared above. Please click the water boiler & warmer of your choice for price information or to purchase.